Escher TSAI (TSAI, for short in the following): We will start from the early stage development of digital art. 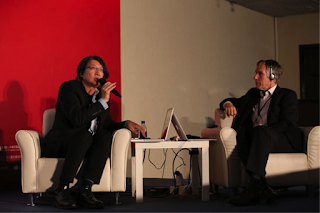 Recalling the new media forum from last year, a scholar and artist from Netherlands mentioned the issues of selling the artworks of new media artists and the problems of the typical new media artist remaining below the poverty curve. We would like to ask Wolf about managing the DAM online museum, from artwork introduction to actual selling; can you share with us how the current new media artwork market is doing right now? Moreover, regarding the artwork selection of DAM, is there a specific preference, for instance, software art? We would like to know Wolf’s take on this subject, and then reflect on Mr. CHANG’s solutions for the music industry, perhaps providing us another point of view. Wolf LIESER (LIESER, for short in the following): Yes, when I first tried to sell digital artwork, most people believe that only the artworks made by 3D or illustration software are worthy to purchase. Purchasing an artwork which can last for the next three, five or ten years is the safer choice, but that conception has Changed immensely nowadays. I kept on explaining to potential clients, collectors or curators that when many artists create, they are either trying to deliver a message that is valuable and interesting to them, or just trying to express themselves in certain ways. Artists do not focus on how to create something that can last forever or think about what sells. Therefore, when facing potential collectors, I will emphasize a conception that purchasing an artwork is supporting the artist to continue creating. It takes an amount of time for them to accept this kind of thinking, but there are also people who are very open-minded, and after a period of time, they really start to think and believe in this manner. Once a collector purchases a digital file sold by DAM, they will receive a USB; he might have only spent 8000 euros, but he can duplicate the artwork as many times as he wants. DAM might also issue the collector a certificate, for example, an artist certificate, declaring the value of the artwork he has purchased, hence the collector would be less prone to try and duplicate the artwork. The certificate symbolizes that the artwork is unique and one of its kind. This action allows each and every digital artwork to circulate around without any restrictions. It only takes two minutes and a click of a mouse to spread the artwork on the internet. This changed the field of art radically, and perhaps even opens up a new method for marketing.